Lately, you’ve probably been hearing words like pinkwashing, settler colonialism, and homonationalism. Maybe you heard that there were a bunch of queer and trans folks wearing hedgehog masks and holding pink signs about Israeli apartheid at the Queer Film Festival. Or you’ve wondered what queer solidarity for Palestine looks like? And how radical queer and trans folks can support Indigenous struggles on Turtle Island or what the connections are between Canadian and Israeli settler colonialisms? Ever wanted to figure out how we can resist pinkwashing and build genuine movements of solidarity that resist all forms of colonialism and occupation? Or perhaps you just want one of those really cool QuAIA bandanas? With the help of some fabulous speakers, QuAIA Vancouver is putting on a panel to discuss some of these very questions, share great info, engage in some discussion and help build radical queer and trans communities. – Mike Krebs is an Indigenous activist of Blackfoot, Cree and european descent. Based in Vancouver, he has previously been active in Palestine solidarity organizing. – Nada Elia is a Diaspora Palestinian. Both of her parents were expelled from Jerusalem in 1948, she was born in Iraq, and grew up in Beirut, Lebanon. A professor of Global and Gender Studies, Elia is a scholar-activist who serves on the Organizing Collective of the US Campaign for the Academic and Cultural Boycott of Israel, and writes and speaks about BDS as a strategy to end Israel’s apartheid practices and policies. Her current research is about the gendered aspect of resistance, including the denunciation of Pinkwashing, Israel’s attempt to tout its (Jewish) gay-friendly record so as to distract from its violations of the human rights of the Palestinian people. This panel will explore the intersections between Israeli and Canadian settler colonialisms and Israel’s campaign of attempting to pinkwash its brutal occupation of Palestine. By appealing to global LGBTQ communities to support the Israeli settler colonial state at the expense of Palestinians, Israel is actively engaging in the pinkwashing of apartheid and occupation. As queers, trans folks, and allies, we are outraged by the appropriation of queer and trans struggles for liberation in order to obscure, excuse, or justify state violence and colonialism. As radical queers committed to anti-colonial struggles and all forms of oppression, we also stand in solidarity with Indigenous struggles against ongoing colonialism here on Turtle Island. When we come out against settler colonialism in all its forms and against Israeli apartheid, we interfere with the myth making that is vital to upholding Israeli and Canadian colonial regimes. Please join us to learn how you can resist this state-sponsored hijacking of our community’s voice, and raise your own voice with ours to say “No Pinkwashing in Our Name!” Oh and there may also be some of those amazing bandanas, possibly even with glitter! 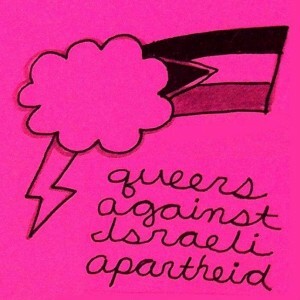 Queers Against Israeli Apartheid is part of a growing international movement – led by Palestinians – against Israeli apartheid, occupation and colonialism. – Room 7000 is on the 7th floor, with elevator access, and is wheelchair and scooter accessible as are the washrooms. – Gender neutral and gendered washrooms are on the same floor as the room. – ASL-English interpretation is confirmed. – There will be designated seating space in the room for folks with limited mobility and for Deaf people, folks who are hard of hearing, and others with barriers to accessing audio. – Amplification via mics and speakers will also be provided. – A specific donation jar will be available for QuAIA to build an ongoing Accessibilities Fund. – Donations are completely voluntary and any donations will be greatly appreciated! – In order to reduce the impact of electromagnetic transmissions (EMT) on folks with EMT sensitivity, we will be asking that attendees turn off their cell phones if possible, or place them in a designated area.